As a school administrator, you can now empower your site instructors to create OneNote notebooks for their Teamie classrooms and add learners to those notebooks. Once enabled, the instructors in the selected classroom(s) can view the OneNote tab in the classroom sidebar menu (below the Materials tab). And they can manage OneNote notebooks for their classrooms. As an administrator, you can enable or disable OneNote LTI Integration optional feature for your site. You can also enable/disable OneNote for classrooms in bulk. Read this blogpost to get more information on this. 1. Access Manage Optional Features page. 2. Click Enable of the OneNote LTI Integration optional feature. 3. A confirmation message appears. Click I understand. Enable. 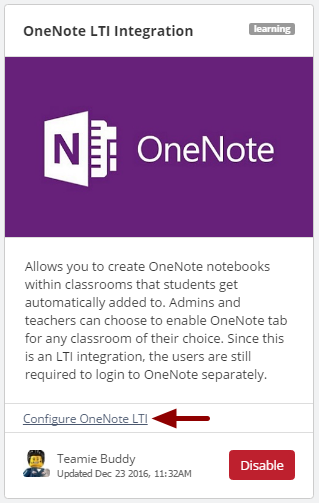 if you wish to enable the OneNote LTI Integration feature on your site. 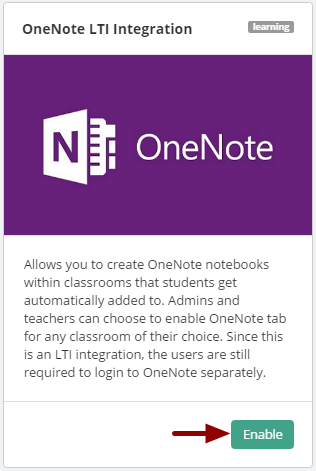 Once enabled, instructors on your Teamie site will be able to create OneNote notebooks for their classrooms. 4. 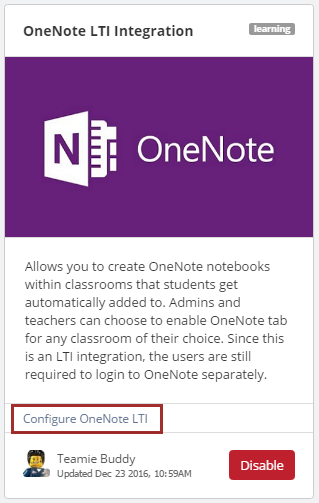 Once OneNote LTI integration is enabled, you will see a link to configure it. 2. Click Disable of the OneNote LTI Integration optional feature. 3. A confirmation message appears. Click I understand. Disable. if you wish to disable the OneNote LTI Integration feature on your site. Once disabled, OneNote tab will no longer be visible within any Teamie classroom. No OneNote notebooks will be deleted and will continue to exist on the respective OneNote account(s). 1. As the Office 365 Admin, go to https://www.onenote.com/lti/dashboard. 4. 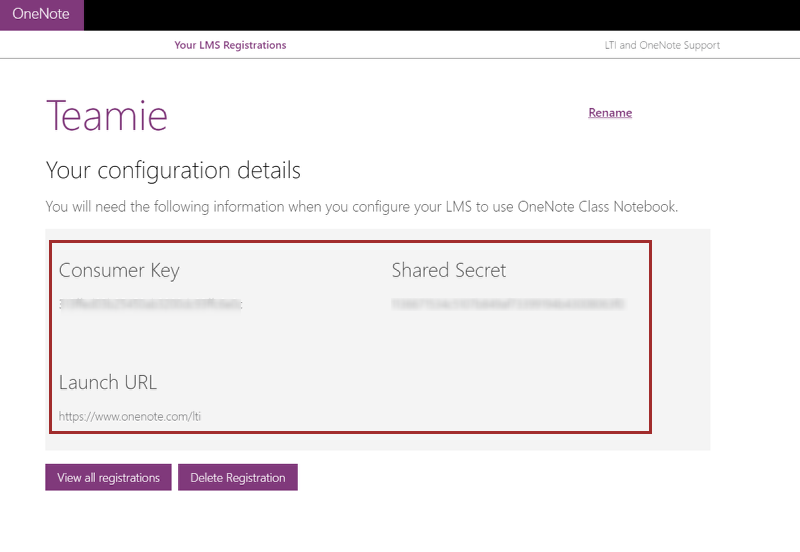 Once you are registered, you will get the configuration details required for configuring OneNote LTI on Teamie. Once you enable the OneNote LTI integration on your Teamie site, you will be able to configure the basic settings required for the OneNote LTI Configuration to work. For this you need to have the configuration details of your OneNote admin account. Let's see how you can configure OneNote on Teamie. 1. 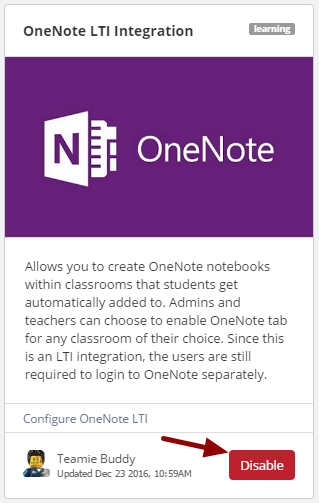 Enable OneNote LTI integration. 2. 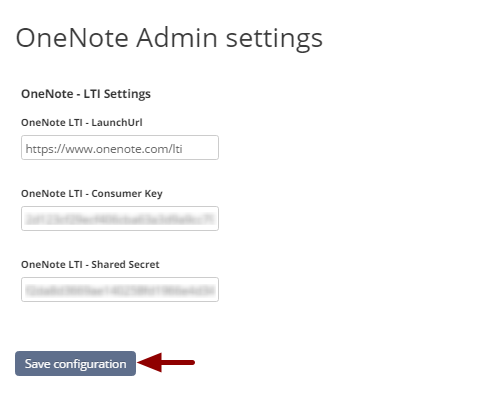 Once you enable the feature, a link appears in the optional feature titled "Configure OneNote LTI". Click the link. The aforementioned are the basic settings that must be configured for the OneNote LTI Configuration to work. Contact your Office 365 Admin to get the configuration details from OneNote. 2. 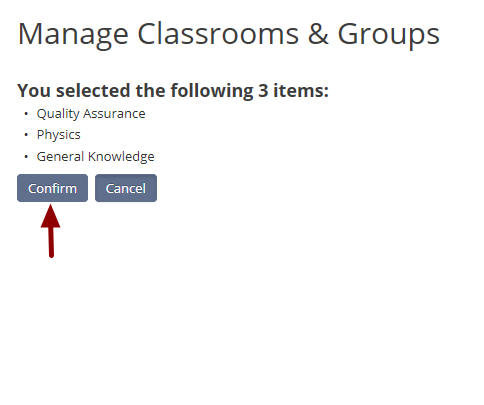 Under Manage Teamie section, click Manage Classrooms and then select Classrooms. 3. Tick the corresponding check boxes for the required classrooms. Tip: You can use the filters on the Manage Classrooms page to search for the required classrooms quickly. 4. Click the Operations drop-down. 7. You will see the list of classrooms that you have selected to enable OneNote in. Click Confirm to proceed or Cancel to make changes in your current selection. 8. A progress bar appears. Once the operation is 100% completed, OneNote will be enabled for the selected classrooms. Once enabled, the instructors in the selected classroom(s) will be able to view and manage the OneNote notebooks from the OneNote tab in the classroom sidebar menu (below the Materials tab).